Remember Seth MacFarlane hosting the Oscars? Crass humor, slick song-and-dance? He has his fans of course. He wasn’t asked back, though. Why not? Probably his humor’s a little harsh. A little racy. In several senses of that word. Probably you love him or you hate him. So, great in “Family Guy,” too offensive for the Oscars, passable in “Ted”—how about MacFarlane in a Western? Maybe he was rubbing his hands together, thinking: “IMDb (or Rotten Tomatoes) says ‘A Million Ways to Die in the West’ is funnier than ‘Blazing Saddles!’” Wrong. Fail! Hubris. Speaking of hubris, this blathering, f-bomb-spewing attempt at Western comedy greatness opens with a helicopter-panning of Monument Valley, bathed in Western fanfare music. Endless amounts of it. How come? Because we need time to read all the credits and see how many balls MacFarlane can juggle. He wrote, produced, directed, and starred in a Western. Look at that! Now he’s Clint. Except he’s no “Man with No Name.” He’s Albert the shepherd. It’s 1882, Arizona. Albert Stark the sheep farmer gets dumped by his girlfriend Louise (Amanda Seyfried) because she’s fed up with the fact that he can’t do anything well. Not even his sheep job. Sheep get up on his roof and such. 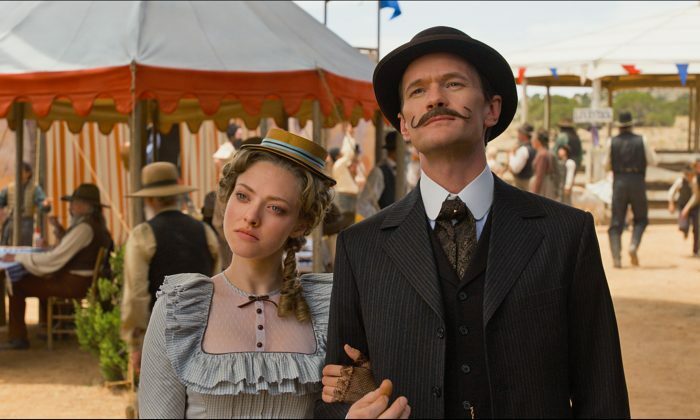 Louise falls for the local moustache-ointment shop owner (Neil Patrick Harris), and Albert eventually falls for Anna (Charlize Theron), the gun moll of Clinch Leatherwood (Liam Neeson). Did you get that Clint Eastwood name-pun right there? Brilliant! Right? No? You don’t think that’s brilliant? Then don’t go see this movie because that’s as brilliant as it gets. Before Albert falls for Anna, the two of them spend most of the movie trying to get Albert’s ex-girlfriend back. Why does he do that when Anna’s so much more gorgeous than Louise, friendlier, and loads more fun, too? Well she’s sort of like his personal trainer. Boosts his esteem, helps him learn to shoot a gun. So he can eventually shoot her husband. But Anna appears to genuinely like Albert’s motor-mouthed, self-involved, fool self. That’s because Charlize Theron’s an excellent actress. And you can’t blame MacFarlane, really. Because if you’re a dude and you’re him, you too would write a scene where Charlize Theron falls in love with the self-centered Albert played by you. But before we get to the shooting of Clinch, Albert really wants to shoot Harris’s annoying twit of a character, Foy. And you can’t blame Albert, really. Foy makes fun of Albert too often and too well in front of Louise. (Foy’s actually the funniest character in the movie). Really? Did they even say “dude” in 1882? Oh, right—that’s roughly the time where the Americanized version of dude (not the original German) originally came from. Tsk. My bad. Liam Neeson is just not funny in this kind of thing. He’s Oskar Schindler. He’s a newly minted action hero. Liam’s too gravitas-having, and too scary, for funny. One does not liberally sprinkle Gravitas Of Neeson on one’s goofball comedy. The thing about gross-out and toilet humor is that, while cheap, it’s effective. Which is why it never goes out of style. Neil Patrick Harris owns the movie’s funniest scene, involving not one, but two bowler hats and no relief in sight. It’s the kind of scene where you fear not being able to get enough air back into your lungs before getting hit with the next laugh and passing out. Do three (okay five) such Richter-scale belly laughs constitute a successful comedy? No! MacFarlane’s patented, slightly line-crossing racist-sounding quips toward blacks, Indians, Chinese, and few other ethnic groups don’t help his bid for comedy-Western greatness. Yes, yes, Mel Brooks got away with it in “Blazing Saddles,” but this is politically correct 2014. Also, there’s a whole big, long, gratuitous, bad-CGI, cartoony sequence smack-dab in the middle of the film that’s jarringly out of sync, style-wise, with the rest of the film. These are all good reasons not to part with your 13 bucks. MacFarlane’s just no Clint. Save that $13 for the next actual Clint movie. We’ll be reviewing Clint’s “Jersey Boys” soon. Hang on ’til then.